An auctioneer by profession, James Forbes started working with metal but wanted to create a more defined image so he added wood to his work. He was active for several years, and was invited to participate in the Nova Scotia Folk Art Festival in 1998, 1999 and 2000. Jim created brilliant caricatures of political figures. 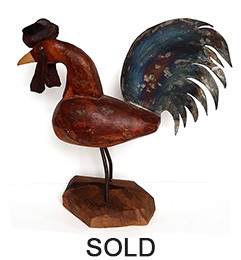 His roosters incorporate found objects which include sheet metal, metal pipe, burls and leather. James also made crooked knives.